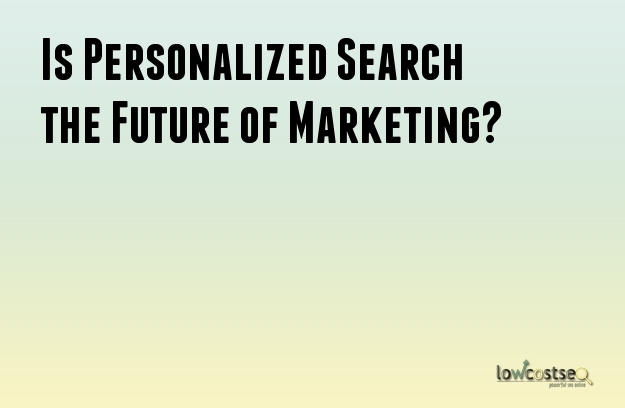 Is Personalized Search the Future of Marketing? Everywhere you go on the web today, you discover more things that are of interest to you and that is not because you are any better at searching than you were a few months back. What is happening now is the growth of personalization. Marketers have shifted their focus to personalized search optimization whereby messaging is getting more and more personal and targeted, making it easier for them to convert prospects into customers. As people increasingly use their tablets and smartphones as primary devices for searching information, a combination of location and social media can be used to manipulate keywords and eventually create a more personalized and tailored online search experience. Today, personalized marketing is the ultimate type of targeted marketing because it creates messages for individual consumers. All marketers have to do is use computer software to develop the individual messages, as well as build customer centric recommendation engines rather than company centric selling engines. Personalized search is the future of marketing because personalized marketing could also be applied to products themselves through using a configuration system, which lets customers to select personal specifications for products they are interested in. Through presenting consumers with products they already desire, marketers have a bigger chance of converting online visits to sales. People who search on tablets and smartphones are usually looking for particular information, which is normally location or time sensitive. With the huge amount of activity on social media taking place on mobile devices, incorporating social suggestions into search results will assist marketers in achieving the most out of the search campaigns. · There is an increasing readiness to compromise on privacy to get a more personalized online experience. This is evident when you use mobile apps such as Facebook or Google Maps, where your location is integrated to personalize the presented information, making it more relevant for you. · Going forward, IP recognition software will offer an online experience that is created for individual users. · The next wave of the shared public user experience is personalization. Conveying personalized messages to particular audiences at the correct time is considered the holy grail of marketing. · The future of marketing is in making products, experiences or websites personal in an intensely meaningful way. · Personalization of search results presents an opportunity to boost your visibility for truly relevant searches. · Personalization is about producing a natural method of conversation between consumers and companies. · Marketers can use the existing technology to ensure that they touch their customers in the correct way at the correct time with the accurate information. · Personalization can help convince customers that they are purchasing things not by persuasion or coercing, but based on their own accord and analysis. As we are currently in an era of competitive marketing, where the supply of marketers is more than the demand of prospects, personalization is an effective way to boost your conversion and separate yourself from the average Joes. This is also the reason why businesses are creating unique sales pages specific to the states (e.g. Texas, Virginia).